Jupiter’s main auroral ring, caused by interactions internal to Jupiter’s magnetic environment, is constant in size. Saturn’s main aurora, which is caused by the solar wind, changes size dramatically as the wind varies. The newly observed aurora at Saturn, however, doesn’t fit into either category. 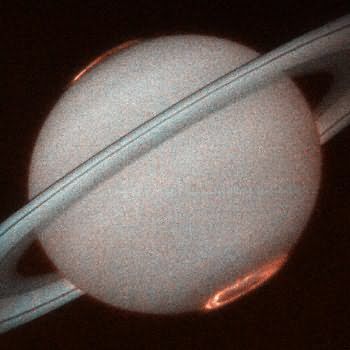 Saturn's aurora in Ultraviolet from Hubble.Credits: J.T. Trauger (Jet Propulsion Laboratory) and NASA. The new infrared aurora appears in a region hidden from NASA’s Hubble Space Telescope, which has provided views of Saturn’s ultraviolet aurora. Cassini observed it when the spacecraft flew near Saturn’s polar region. In infrared light, the aurora sometimes fills the region from around 82 degrees north all the way over the pole. This new aurora is also constantly changing, even disappearing within a 45 minute-period. Might just be that picture but it lines up with the hexagon remarkably well! Completely amazing stuff. It seems almost daily new and totally unexpected things are discovered. It shows in infrared only or does it have a signature n other wavelengths? Saturn doesn’t have enough mass to become a star. Very cool and unusual story and pictures. That hexagonal feature has always puzzled me, too. Why wouldn’t the infrared and ultraviolet aurorae be two different signatures of the same aurora ? one of them changes predictably a the Solar Wind changes. Maybe Saturn the giant gaseous planet wants to become a new star and is igniting, it large enough. The correspondence of the infrared aurora and the hexagon indicates, one may suspect, a connection between the two. Auroras are the photon emissions of plasma/electron currents (a finding supported by the recent Cluster satellites in Earth orbit), so it’s reasonable to conjecture that the hexagon is an electrically induced phenomenon. I just finished reading an article about thermodynamics in Scientific American. It seems that, if you have a thin fluid layer and heat it from the bottom, a strange thing happens. As the temperature gradient across the layer increases it begins to move. Not chaotically, as you might expect, but quite orderly. In fact, the fluid will form small hexagonal cells as though it were a crystal! Only continued heating will produce turbulence. Is it possible that the observed hexagon pattern on Saturn is somehow related to this phenomenon? If it’s not, it sure is a heck of a coincidence! I imagine there is a lot of heat in Saturn’s interior. That could be the heat source fot the scenarios you mentioned. Previous PostPrevious Less Than 20 Years Until First Contact?